I first came into contact with the 2017 Acura NSX back in October 2015 on the track at the Honda Research Centre in Tochigi, Japan. The encounter was brief as it was intense; I was only able to do two laps in it. So I jumped at the opportunity to renew acquaintances with this new exotic Japanese car and take it for a more thorough test drive on the private racetrack at The Thermal Club, then on the roads in the Palm Springs area. The Thermal Club is a private track used by wealthy exotic car collectors. Totalling 4.5 miles, the circuit can be configured in several different ways. That day, we were using the South Palms track, which is 1.8 miles long and includes nine corners. The circuit is almost flat and the landscape looks like Radiator Springs from the movie Cars. The tranquility of the surroundings was interrupted only by the sound of the sports cars on the track and the sound of the private jets taking off and landing at Jacqueline Cochran Airport five miles away. Basically, this place simply oozes affluence, and at $189,900 for the basic trim and $250,100 for the all-dressed version, the NSX fits in perfectly. Five pre-production prototypes, all bearing the serial number “0000,” were waiting in the pits for our small group of journalists. I grabbed a helmet and got in. The second-generation NSX is an extremely complex car from a technical standpoint, but you’d never know it looking at the cockpit, where simplicity reigns. The seat cushion can be adjusted forward and backward, but not higher and lower, the seatback reclines to a limited degree and the steering wheel is both telescopic and height-adjustable. Forward visibility is excellent thanks to the streamlined A pillars and the slope of the hood. We immediately noticed the Dynamic Mode selector dial on the central console, which allows you to choose from four driving modes: Quiet, Sport, Sport Plus and Track. On the track, with Track mode engaged (naturally), the NSX’s handling and its optimal, even surgical actuation is reminiscent of a laser-guided missile. Weight distribution is 42% front and 58% rear. From a technical point of view, the NSX is an impressive feat. The ace up its sleeve is its hybrid technology: a 3.5-litre twin turbo V6 and three electric motors, the first of which is sandwiched between the gasoline engine and the nine-speed, twin-clutch gearbox. The other two are linked to the front wheels, thus helping the NSX behave like a front-wheel-drive car when exiting corners and use its torque vectoring capability to turn the exterior front wheel faster than its interior counterpart for improved agility and combatting understeer. The most impressive and unexpected aspect of the NSX is the feeling you get that the front end is literally “pulling” the car as it exits corners. However, it’s not what we would call a “natural” feeling and requires you to adjust your cornering technique slightly so that you get the most out of the NSX’s technical sophistication. One major handicap and two irritating faults became obvious on the track. The major handicap is the NSX’s weight of 1725 kg (3803 pounds) without options. Although the NSX is extremely efficient on the track, it simply cannot completely ignore the laws of physics. We wondered what this car would be capable of if it was 150 or 200 kg lighter. The two irritating faults? The seat is not height-adjustable and I constantly felt like I was too high in the seat. For a high-calibre sports car, the height of the driver’s pelvis is an important factor for properly feeling the car’s reactions and to really become one with the vehicle. In short, the NSX lacks that seat-of-the-pants feel. Furthermore, the side bolstering on the seats is soft, meaning it’s comfortable to get into car, but there isn’t enough lateral support for driving on a track. Between two sets of laps on the track, I went to another section set up for testing the automatic launch control system developed for the NSX. The procedure is very simple: select Track mode using the Dynamic Mode dial, hold down the brake with your left foot and press all the way down on the accelerator. The 3.5-litre, twin-turbo V6 revs at 2,200 rpm and the light indicating that launch control is engaged turns on. Then all you have to do is release the brakes and the car is catapulted forward with a G-force that is as surprising as it is immediate, thanks to the instant torque from the three electric motors working in concert with the twin-turbo V6 to ensure optimal actuation. The NSX launches as fast as a Porsche 911 Turbo, but the effect is much less dramatic because of the more muffled sound of the NSX’s engine. There’s no denying its efficiency with its phenomenal forward thrust, but the experience is not necessarily as exhilarating as with other high-calibre sports cars. 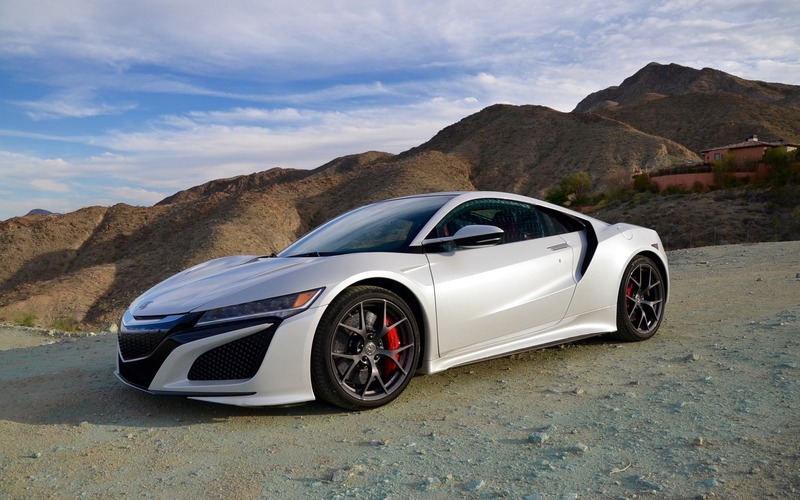 On the road, the NSX proved docile, comfortable and silent in Quiet mode, which limits revs to 4,000 rpm and helps the car take off in utter silence using only electric power. Sport mode lets the gasoline engine express itself normally while keeping the start/stop feature that cuts the engine when the car is stopped. Sport Plus mode makes the accelerator respond more quickly, the magnetorheological dampers and the front end’s two electric motors become more involved. Track mode lets you use the launch control system and delay the intervention of the electronic stability systems. The NSX doesn’t offer much in the way of storage in the passenger compartment. There’s a glove box and a small compartment with a USB jack situated between the seatbacks for your smartphone. There are no storage pockets in the doors and no cupholders. The infotainment system is the same one found in the Honda Civic or HR-V. It offers low-resolution graphics, which is not at all consistent with a car that goes for more than $180,000, but at least it has Apple CarPlay and Android Auto. The trunk volume is very small, to the tune of 4.4 cubic feet or 125 litres, and, since the trunk is located just behind the engine and above the exhaust, the internal temperature of the trunk can become very hot—so hot in fact that it can melt a pack of gum and make the zipper of a windbreaker burning hot. Take my word for it. In the end, the connection between the driver and the NSX is more cerebral than it is visceral, which is 100% in keeping with current trends that favour efficiency above all else. The NSX’s speed is formidable, even ferocious at times, but we’re still waiting for that spark to light our passion, as the NSX is in large part devoid of the beautiful poeticism you look for in exotic cars with naturally aspirated engines. The NSX is truly an amazing technical feat, it delivers very good performance for the price and will surely be very reliable. But it lacks a bit of character and emotion. 9/10	An efficient car with an average of 11.2 litres per 100 kilometres. 9/10	The NSX sprints from 0-100 km/h as fast as the Porsche 911 Turbo, but without the visceral thrills. 4/10	The NSX is equipped with the same infotainment system as a Honda Civic. Disappointing. 9/10	Fast on the track and comfortable on the road. 8/10	As advanced from a technical standpoint as a Porsche 918 Spyder for a quarter of the price.